Write a PHP function to convert a string to an array (trimming every line and remove empty lines). $string = "  IANA is the global coordinator of the DNS root. => IANA is the global coordinator of the DNS root. => of the details of the existing operators. 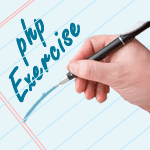 Previous: Write a PHP script to remove all white spaces in an array. Next: Write a PHP script to create a two-dimensional array (4x4), initialized to 10.